It’s surprising that super-slim jackets for the iPhone aren’t more common. A simple slip that covers an iPhone 4S, iPhone 5 or iPhone 5S and – for an extra US$4 – adds a handy pouch on the front, the Waterfield Designs Suede Jacket is a lightweight and handy solution for travel of all kinds. Weighing just 10g, this slip all about simplicity. Inserting an iPhone into the super-slim suede is a cinch, though it’s snug enough for it not to fall off, or come off in a trouser or shirt pocket. It’s worth noting that there are two versions of this case; one takes into account the popularity of the Apple Bumper (for iPhone 4S) and the Apple Case (for iPhone 5, iPhone 5S and iPhone C), and sizes-up slightly. They both cost US$14 and come in black only. Although it’s available in black, we went for the zebra skin-design (it’s not real zebra!). One of Waterfield Designs’ ‘hot animal prints’ that cost an extra US$2, the other available for this jacket being Cheetah. We’re guessing most will choose black. 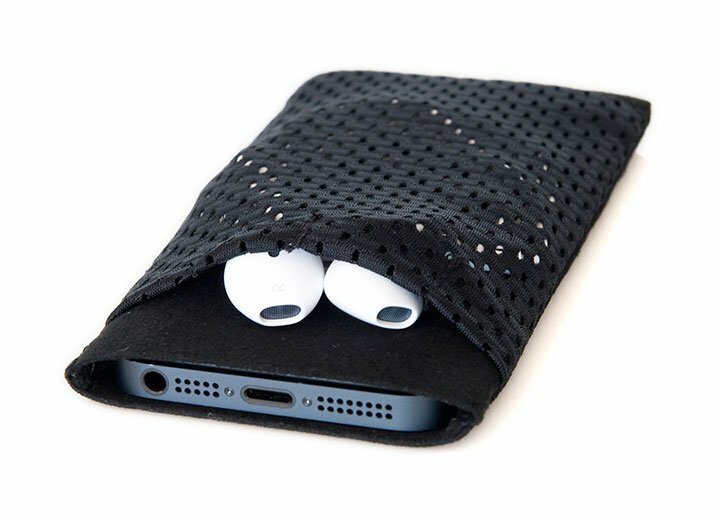 Although the suede styling is soft and snug, it’s the custom-made mesh pocket for earphones, keys, cards and cash make this a handy smartphone slip for short trips and nights out.